Posted on July 5, 2009, 10:19 pm, by E gan F, under Photos. Frequently on the bicycle when I’ve seen feathery oceans of grassy stuff, mostly in central Ireland or the Plains States of America, I’ve stopped cycling, walked over and touched it. This photo is of just a single plant. There is no ocean. But even single plants take me to places I’ll never see again. I’m certainly open to being enlightened about whatever this stuff is called. 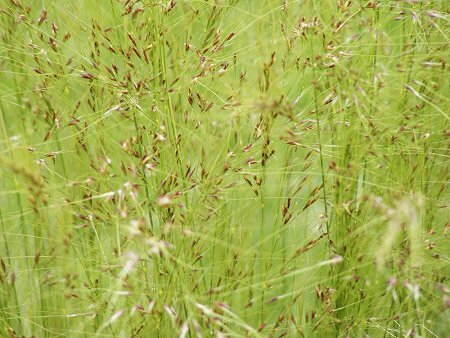 It’s a Brome grass. Which one I don’t know - it’s been decades since I studied grasses.